How do I Become a Repo Agent? 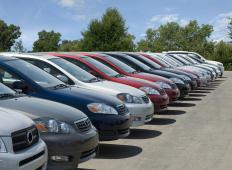 Repossession agencies may work for specific car dealerships. When a person enters into a contract to purchase property, he sometimes agrees to make installment payments on it instead of paying the total all at once. In some cases, however, an individual may have difficulty making timely payments. If a buyer defaults on his payment agreement, the company with which he's made the payment agreement may hire a repo agent to retake possession of its property. An individual who wants to become a repo agent may not need any particular level of education, and only a few places require a person who wants to become a repo agent to secure licensing to work in this field. Many do require candidates to earn commercial driver's licenses, however, and securing some form of training may help a person to have a better chance of landing this job. Generally, a person who wants to become a repo agent may boost his chances of landing a job by earning a high school diploma or its equivalent. While some employers may hire individuals who lack such credentials, many employers prefer candidates with this minimum level of education. There is no set training program a person has to complete in order to land this job. An individual may, however, learn about this job by speaking with established repo agents or even arranging to ride along with one as he performs his job. A person may also find training courses online, though these courses usually do not guarantee that a student will land a job. There are a few places in which a person will actually need a license to become a repo agent. Often, however, the requirements for licensing are fairly easy to meet. For example, a person may need to be at least 18 years old, free of felony convictions, and willing to submit to a background check. Additionally, a person may need to earn a commercial driver's license in order to become a repo agent. This usually involves passing a commercial driver's license exam. Once a person is ready to become a repo agent, he may apply for a job with a repossession agency. He may also do well to inquire about available jobs with companies that tend to hire repo agents, such as used car lots. Additionally, some people may opt to start their own repossession businesses rather than looking for employment in the field. In such a case, a person may also need a business license, bonding, and insurance to pursue this career. How Do I Become a Repossesor? How do I Become a Repossession Agent?